Chelsea + Jorge's post-wedding adventure session felt like a dream. There are some parts of it that I have to look at the photos to remind myself that, yeah, that actually happened. 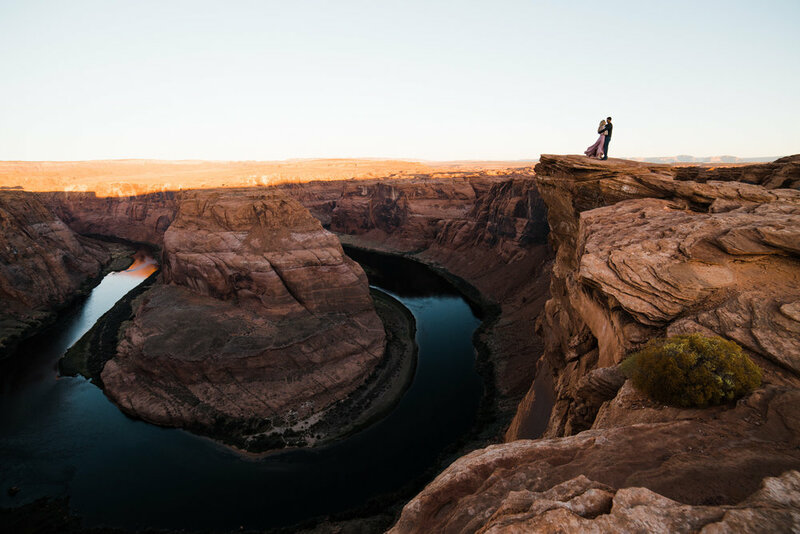 They both grew up in Florida, but decided to get married out west because they had always wanted to explore out here and figured their wedding + honeymoon were a great way to do so. 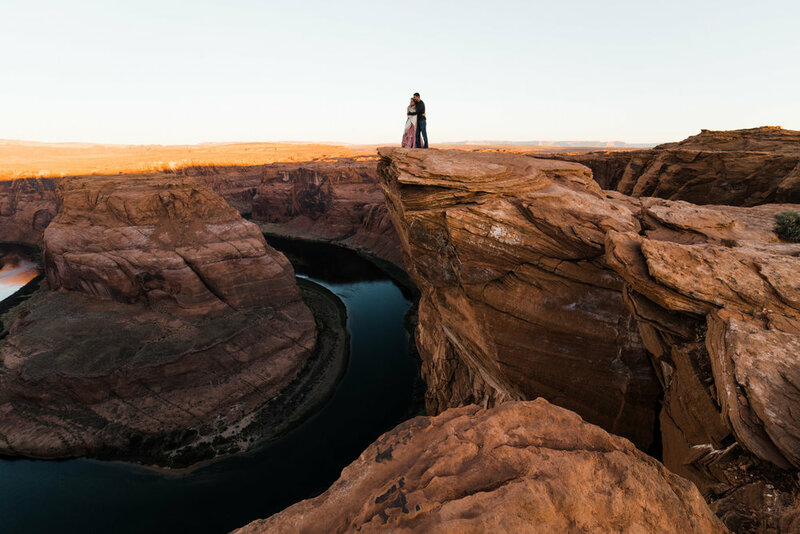 After flying into Vegas, they had an intimate wedding ceremony in Valley of Fire State Park and then began an epic roadtrip around southern Utah and Northern Arizona. They visited Zion National Park, Horseshoe Bend, Antelope Canyon, Lake Powell, and Grand Canyon National Park. 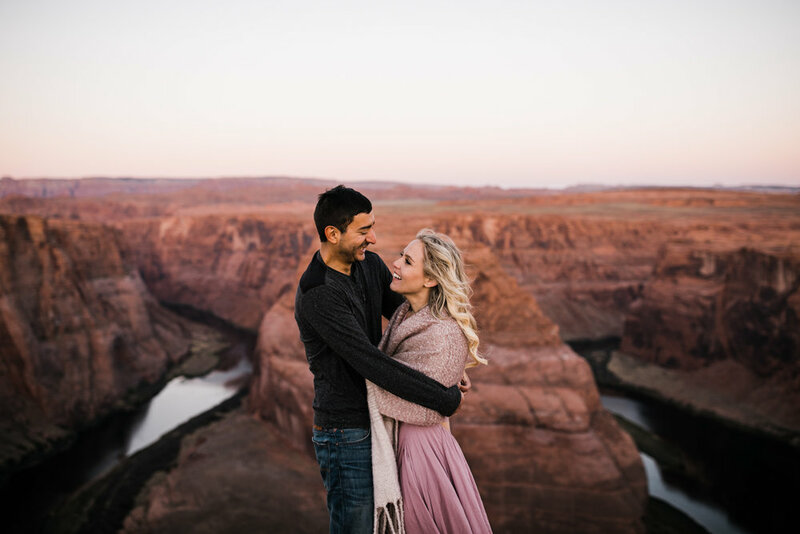 They chose to meet up with us in Page, Arizona and do an adventure session at Horseshoe Bend and Antelope Canyon, which are two places I've been dreaming of doing a session at for a long time! We had been to Horseshoe Bend a number of times, but Antelope Canyon was all new to us and it felt like such a treat to be exploring it with these two. We met up before sunrise in the Horseshoe Bend parking lot and hiked out to the edge in the dark to claim a spot. It was way colder than we anticipated, but Chelsea + Jorge were total troopers braving the wind for the gorgeous sunrise photos! We were lucky enough to grab a spot with a perfect view of the entire curve and we had so much fun watching (and photographing) the awe on their faces as they took in the epic view for the first time! 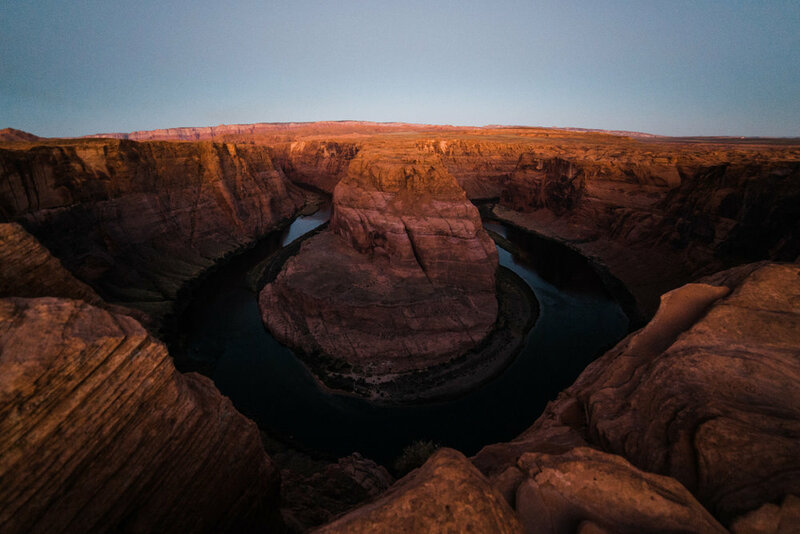 Horseshoe Bend is such an unreal place and its pretty difficult to capture it's grandeur in photos, but I'd say Callen did a pretty amazing job with our wide angle lens ;) Photographers - if you're ever shooting here, you must get a wide lens!! It makes all the distance. The super wide shots are with a 14mm, while the tighter ones are with a 35. I still love the 35mm shots, but I think the wide is definitely necessary for some (same with Antelope Canyon). After taking in the amazing sunrise, we warmed our toes and headed into Page for our Antelope Canyon tour! This day was so epic that we decided it deserved two blog posts, so keep an eye out for the Antelope Canyon photos later this week!